Clementine is haunted by regret. It was just a barbeque. They didn’t even know their hosts that well, they were friends of friends. They could so easily have said no. But she and her husband Sam said yes, and now they can never change what they did and didn’t do that Sunday afternoon. Australian writer Liane Moriarty’s success is phenomenal, with six international best-selling novels, translation into 39 languages and an HBO series starring Nicole Kidman and Reese Witherspoon currently in production. It is, however, sometimes easy to dismiss the popular and if it hadn’t been for the enthusiastic tweeting of a former colleague while they were reading an earlier Moriarty novel, Big Little Lies, I might not have been encouraged to give this writer a try. All I can say is thank goodness I did because Moriarty is one of those rare novelists who writes for a wide audience but with a nuance and depth that sets her stories well above the ordinary. 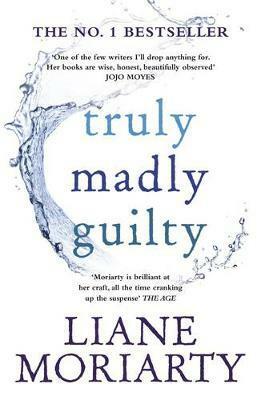 Set in Sydney, Truly Madly Guilty covers the period before, during and after a Sunday afternoon barbecue and follows the consequences of that event on the three couples involved and their children (and yes, in summary the plot may remind you of The Slap but rest assured this is its own unique story). The book’s central themes are obligation and guilt, and these are represented through a number of the relationships but centrally through the complicated friendship between Erika and Clementine. I am hesitant to say much more about the content of the book as the way in which the story unravels through flashbacks and different points of view is best left for readers to discover themselves. I loved this book – much more than I expected to. The concluding chapters pack some unexpected emotional punches that left me in awe of the novel’s structure as I realised how well thought-out this 500-plus page book is, and there isn’t a word wasted. If you are already a Moriarty fan then you will need no encouragement from me to read this book (you are probably already reading it now). If, however, like me you have been curious as to why her books are so popular, I urge you to take the plunge. Truly Madly Guilty is a great place to start.